Special Operations Weather, commonly referred to in the Air Force as Combat Weather, used to be a special duty assignment available only to trained and certified Air Force Weathermen (AFSC 1W0X1). In January 2009, the Air Force decided to make this duty a separate AFSC. Before this new AFSC, weather Airmen applied to become special operations weathermen after already being in the Air Force. 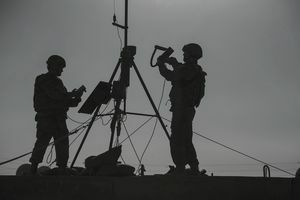 Now, recruiters can enlist trainees directly into the 1W0X2 special operations weathermen career field since the Air Force specialty code is now in the enlisted classification directory. 1W052 Journeymen assigned to special operations units observe, collect and analyze atmospheric, oceanographic, space, terrestrial, riverine and littoral environmental information from data sparse, sensitive, non-permissive, hostile and data denied areas and predict future conditions. They provide tailored analyses, forecasts and predictions of mission impact during the joint operational planning process and military decision-making process to enhance the effectiveness of military operations and training. They integrate tailored analyses, forecasts, and predictions of mission impact into the joint operational planning, military decision-making, and command and control processes to enhance the effectiveness of military operations and training. Journeymen operate atmospheric, oceanographic, space, terrestrial, riverine and littoral environmental equipment and monitor specific parameters affecting military operating areas, ranges, and routes. Journeymen forecast local area and mesoscale weather features and alert decision-makers of severe weather potential. They prepare and deliver briefings and provide mission execution forecasts to aircrews, warfighters, and weapons system operators. Journeymen conduct environmental collection operations, perform tactical mission planning and preparation, prepare personnel and equipment for military operations. They conduct reconnaissance and surveillance of routes, areas, zones, and objectives of interest. They operate ground-based sensors and unmanned aerial systems to support reconnaissance. Journeymen train SOF, coalition, and foreign national forces to conduct limited observing and survey host nation meteorological capabilities. They deploy by land, sea or air to participate in the full spectrum of military operations. They use demolitions to create or remove obstacles to maneuver and to prepare tactical sites and maintain qualification on primary assigned weapons. Certification Training: Upon graduation from the Special Operations Weather Apprentice Course at Pope, students are awarded their 3-skill level (apprentice). All combat weather 3-levels are first assigned to the Special Tactics Training Squadron at Hurlburt Field in Florida for 5-level (technician) upgrade training. This training is a combination of on-the-job task certification, and enrollment in a correspondence course called a Career Development Course (CDC). Once the airman's trainer(s) have certified that they are qualified to perform all tasks related to that assignment, and once they complete the CDC, including the final closed-book written test, they are upgraded to the 5-skill level, and are considered to be "certified" to perform their job with minimal supervision. For this AFSC, 5-level training averages 16 months. Once they receive their 5 skill level, they proceed to their first operational assignment. Advanced Training: Upon achieving the rank of Staff Sergeant, airmen are entered into 7-level (craftsman) training. A craftsman can expect to fill various supervisory and management positions such as shift leader, element NCOIC (Noncommissioned Officer in Charge), flight superintendent, and various staff positions. For the award of the 9-skill level, individuals must hold the rank of Senior Master Sergeant. A 9-level can expect to fill positions such as flight chief, superintendent, and various staff NCOIC jobs. Assignment Locations: Multiple Air Force flying wings, and Army aviation and ground combat units.